What’s the secret in your nest? About two weeks ago I bought a beautiful, new, red camera. 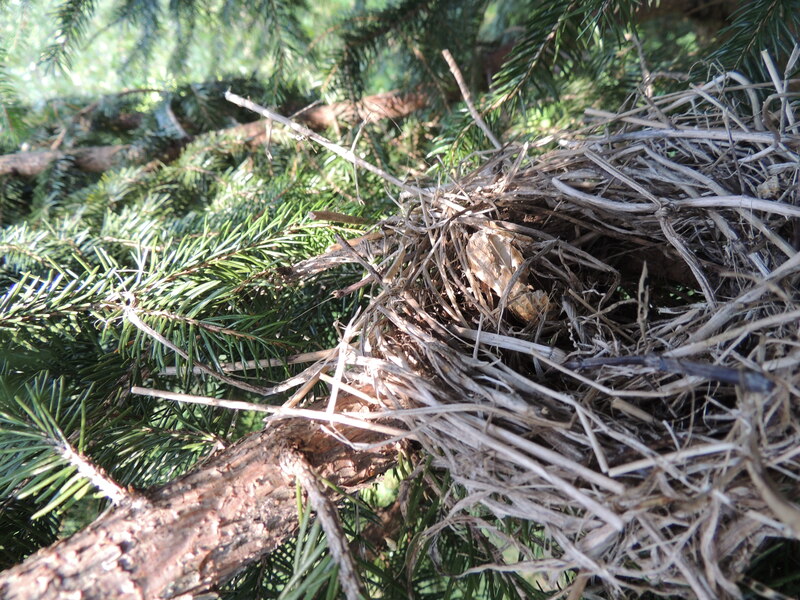 A couple of days later I was outside enjoying the sunny, warm weather with my daughter when she discovered a little nest in a nearby tree. Even by holding her camera/phone above it to take a photo, she wasn’t sure what was in it, maybe a dead bird? We hoped not. My new digital camera has the handy feature of an adjustable monitor so that I could see my intended subject by angling the monitor down while holding the camera above the nest. This let me see that I had in frame what I wanted, but it wasn’t until we looked at the captured image that we could see what was there. What do you think we found? Take a look. Yes, that’s a peanut shell! Although I would get a kick out of telling you that we found a new and unique way to grow peanuts, I’m sure you wouldn’t believe me anyway. The truth is my dad has a peanut holder hanging on another tree and filled it with roasted peanuts in the shell. Obviously, either a bird – or maybe a squirrel – took its prize to a more private place and released the peanut for his own satisfying snack. And, those of you who are allergic, please note it is an empty shell. 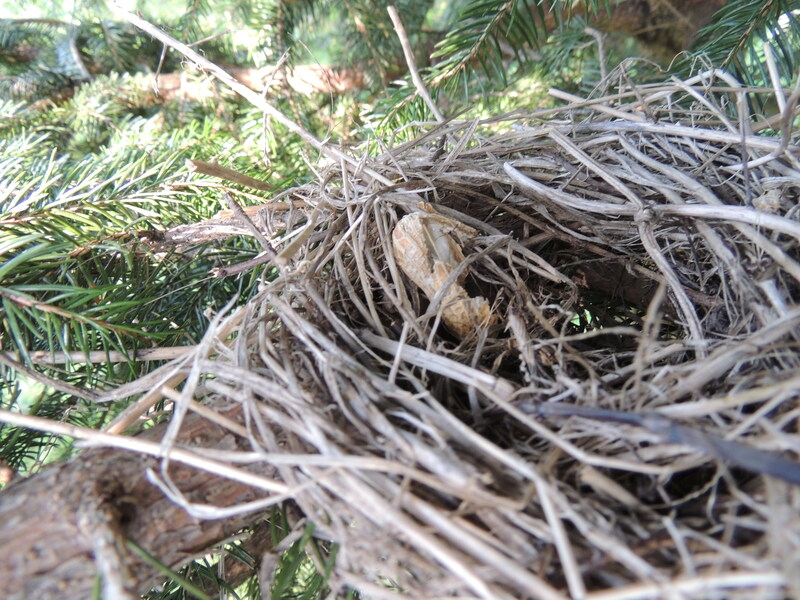 The way my brain works, I began thinking about this peanut shell hidden in a bird’s nest. But I didn’t just think about how funny that is, but also the uniqueness of it. How often do we keep to ourselves the thing we most would like to do for fear of people thinking we are crazy for considering such a thing? Such as .. oh, I don’t know .. skydiving, for example. Or running a marathon, or writing a book, or teaching what we know to people who really want to learn. Why are we so afraid of living our lives to the fullest? Why do we practice singing when no one is there to hear us? Why do we dance but only when we are alone? Why do we write in secret? Why do we hide our stash of peanuts (our talents and giftedness) and enjoy them privately instead of sharing them? I think it’s fear of rejection, or ridicule, or .. ‘not good enough” mentality. I believe in order to overcome the fear of what others will think of us, we must first accept ourselves and the way God has gifted us. We must see ourselves honestly and then take that first step. Take a class, or join a club, or offer our abilities where there is a need. Do whatever is necessary to learn, and discover and grow. Now that we are in the age of Internet communities we have tremendous advantages and opportunities to connect in areas once not accessible. We have no excuse anymore. So, why do we hide? I know that once we step out we’ll find many others who feel the same way, and through our efforts to grow they will be encouraged to crawl out of the nest, too. How do I know? Because I was afraid, someone encouraged me .. and still does .. and I am crawling out of my nest. It’s not so scary after all! What’s in your nest? What unique gift do you have that you are not letting the world know about yet? Or, what have you done to take that step and change your life? This entry was posted in Miscellanea, Preambles to Writing and tagged bird's nest, camera, fear, God, Internet community, peanut, Photography, private place, talents, uniqueness. Bookmark the permalink. What a beautiful and unusual blog post, Lynn, and one that I needed to read, especially today. Thank you so much! I am glad it was a blessing to you, Sue. Thank you for your comment. I’m glad my post made you think. Thanks for your comment, Eric. This is a great post, Lynn! It’s an analogy that hits home. I pursued a lot of my interests in private for years, convinced they were insignificant, until I decided to take a night school class in oil painting that eventually led me to work in a summer co-op craft store where my paintings were sold. Then, while attending dog shows and obedience trials, a friend encouraged me to step out of my comfort zone and begin my own dog show business. Later on another friend suggested I should be writing my stories… and all these years later those methodical baby steps have made me brave enough to write novels and create a public blog. Who knew? I think a lot of people fear they will appear foolish, frivolous or arrogant, so they keep their dreams to themselves. Or, as you suggest, they fear failure or rejection, and decide it’s less humiliating not to try at all. Good for you, Carol! You not only are talented but accomplished, having stepped out to live your dream. I admire that. And I need to be more that way. Wow! That’s quite a visual. It is a quote that certainly has lots of meaning packed in. Thank you, Donna. Yes, I think we must be, judging by your newest blog post. 🙂 Thanks for stopping by, it’s good to see you again.